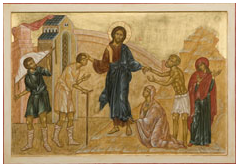 The concern that Christ showed for the bodily and spiritual welfare of those who are ill is continued by the Church in its ministry to the sick. HOLY COMMUNION TO THE HOMEBOUND OR HOSPITALIZED is provided on a weekly basis. If you are unable to participate in Sunday Mass and would like Holy Communion, please call the parish office (721-2405) and speak with Deacon Ron Butler, Pastoral Care coordinator. 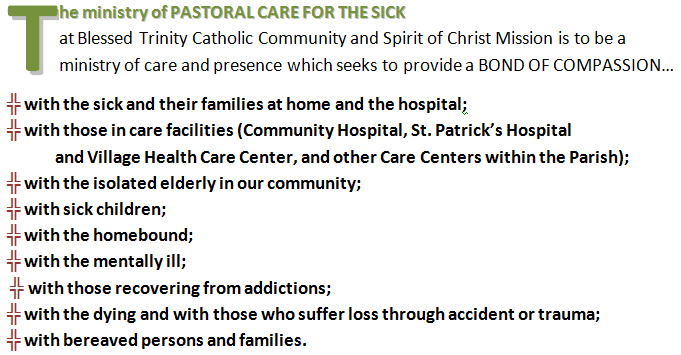 Pastoral Visit and HOLY COMMUNION is provided daily at COMMUNITY HOSPITAL. Please call the parish office for communion at Community Hospital. REMEMBER to “request a pastoral visit” when being checked in at the Hospital. IF YOU ANTICIPATE HOSPITALIZATION OR SURGERY, you are invited to celebrate the SACRAMENT OF THE SICK prior to your admittance to the hospital. The sacrament is usually celebrated following the weekend Masses in the Blessed Sacrament Chapel OR during the celebration of Sunday Mass. Please contact the parish office to schedule the Sacrament. The sacrament may also be celebrated on any weekend following Mass without prior scheduling. Speak with a member of the Staff before Mass begins. BOND OF HEALING LOVE REALIZED THROUGH THE CELEBRATION OF THE SACRAMENTS: Anointing and Holy Communion for the sick, Viaticum for the dying and the prayer of the church for the dead. Through the caring ministry of our community the funeral rites of the church are celebrated with reverence and dignity and bereaved families and friends are supported in word and deed. VISIT THE BLESSED SACRAMENT CHAPEL at Blessed Trinity or Spirit of Christ and pray for the sick and dying.